The room was jammed. Elbow to elbow, people tried to work their way toward the bar. A crackle of excitement ran through the crowd. An appearance by an American Idol contestant or maybe a headliner from the most recent Hollywood box office hit? No. It was a tasting of wines from Washington State’s micro-wineries held recently at Corks in Rossford and the crowd was their largest ever, more than double the size of a typical tasting. That’s something that could change with rapidity, according to distributor Dave Pirwitz of DJP Selections. During the recent winter charity season, his company donated and poured 25 different limited-production Washington wines at four events. Most recently, he poured at the YMCA's Four Your Y Scholarship event at the Belmont Country Club. It was a themed event with four distributors each pouring based on one of the letters of YMCA. DJP had C for Columbia Valley, and poured six Columbia Valley wines, all extremely well received. Columbia Valley, Washington’s largest winegrowing region. is on the same latitude as Bordeaux, France. The Corks tasting featured a lineup showing Washington winemakers’ impressive range. The Covington Cellars (Woodinville) Viognier was light honey and color with a somewhat grassy taste. Enjoyable, but the most remarkable thing to me was that Washington State producers make this wine. The next taste was Gilbert Cellars (Columbia Valley) 2008 Gewürztraminer. This is the winery’s initial bottling of Gewurz. It casts off a great floral bouquet and finishes with trademark spiciness. It has 2.5% residual sugar (0% is bone dry) so it has sweetness but not overwhelmingly so. Did someone say micro-wine? Cascade Cliffs’ Goat Head Red certainly fills the bill. This is a winemaker’s blend featuring Nebbiolo, Barbera and Cabernet Sauvignon. As we were told, this is made from odd lots left from other bottlings, so the blend is different from year to year. Only 84 cases were produced. In fact, only 3,000 total cases of wine are produced annually by Cascade Cliffs. This is a highly drinkable wine, low in tannins. The Smasne Cellars 2007 Phinny Hill Vineyard Carmenere is another small production wine with only 103 cases produced. 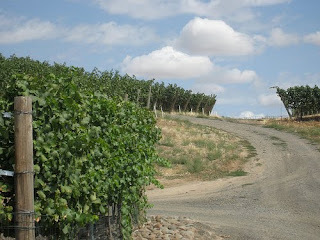 Phinny Hill is a vineyard within the Horse Heaven Hills AVA with a different soil and can be subject to flooding. The wine is barrel-aged for 22 months imparting a nice oakiness. The wine has flavor notes of white pepper and smoke and can easily compare to a Napa Valley wine of $60 or more (although it retails for about $35). We are big fans of Malbec and so were anxious to try the Gilbert Cellars 2007 Estate Malbec. This is made from grapes grown in the Gilbert vineyards on the south facing hillsides of the Wahluke slope. It has prominent dark fruit and a bigger structure than the other reds we sampled. Tastes of black pepper on the finish. This is a nice Malbec and, according to Mike, Malbec is the next big thing in Washington. “Washington has been making great wine for a number of years, but is only recently starting to come into it's own,” said Gregg. “Add to that the high number of values and accolades and you've got a lot of consumers starting to take notice.” He said that when Columbia Crest's 2005 Cabernet Sauvignon Reserve was named Wine Spectator's 2009 Wine of the Year, it opened quite a few eyes to the quality of Washington wines. We wrapped up our tasting with the Gilbert Cellars 2006 Allobroges, a Rhone blend of 60% Syrah, 22% Grenache and 18% Mourvedre. This wine (500 cases produced) is an elegant drink with rich flavors of black berries. It is a blend of grapes from four Columbia Valley vineyards. The range of wines produced in Washington is really astounding – far beyond Merlot or Syrah. Explaining why he likes Washington wines Gregg says, “I like the unique microclimates of Washington. These little pockets of terroir allow winemakers the opportunity to grow a wide range of interesting and exciting varietals.” While most plantings are dedicated to Riesling, Cabernet Sauvignon, Merlot, Chardonnay, Syrah and the other Rhone varietals he sees an uptick along with some more obscure grapes. Among Gregg’s favorites Washington wineries are Cayuse, McCrea, Syncline, Five Star Cellars, Owen Roe, and Alexandria Nicole. Thanks for the mention of Goat Head Red. It's our winery's workhor- err- goat. The production for the bottling you tried was around 500 cases. Not a huge number, but a lot more than 84. 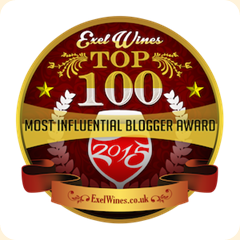 Love the blog- keep up the good work!